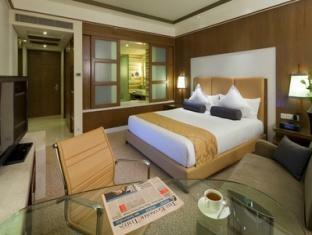 If you are on a business travel in Okhla and Nehru Place area, this is a wonderful hotel to be. Of course it also caters to individual travellers, but it hasn't much around in terms of markets etc where you can step out for a browse or a cuppa in your spare time. 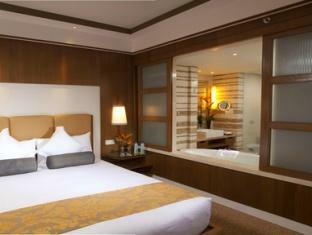 The rooms are large, beds and ensuite facilities on expected lines. The brand lives up to its expectations. The staff are professional, friendly and helpful. The only irritant for me was the traffic noise. With my room facing the wide main road, I could hear the vehicles noise till very late at night, which affected my sleep. Thankfully, to that extent, I stayed only one night. But maybe, double glazing of the window panes may do the necessary job? Just a thought.... Will I recommend this hotel? Certainly! There!! Just did that! This was a very nice hotel. Rooms were nice, modern and clean. Lovely big bathroom with bath. The food was excellent. Lovely breakfast buffet with international, Indian and Chinese food. Lovely buffet spread in the evening with Indian & continental/Asia options. The service was good. Staff were extremely friendly, polite & helpful. They happily organised a car to Agra to visit the Taj Mahal as well as a car to visit the city. I would highly recommend this hotel. Thank you. 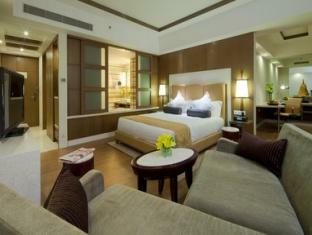 Nice spacious room, cool bathroom, staff were excellent and couldn’t do enough to help. The food was great. Definitely recommend. Excellent service with great breakfast buffet as well as a la carte dining options. Beautiful hotel with fantastic staff in a very poor location. The hotel is situated quite far from any sites or restaurants. good price, service better than expect. The facility, staff, cleanliness, food was perfect. The only negative thing is that the surrounding area of the hotel is not good. But there is nothing that the hotel can do about it. I am fully satisfied by the hotel's offerings. All good. Nearby to office. Location is very good if you want to be close to some export facilities. Close to the highway too. Food in general not that good for this hotel standard, breakfast or dinner. Staff was really very nice and helpful. Room is very comfortable, the only downside is the little choice of TV english channels. Then was the surprise : a dying rodant by the fridge area, just when I came back to my room after the breakfast. I was upgrated to a suite, free bottle of wine, deep apologies, but the damage was done in my brain. I don't know how this could happen but I hardly will come back there. I ate dinner in the restaurant and the food was mediocre and very expensive. The bathroom looked run down with brown water in the toilet. Staff were nice. Extremely helpful and attentive staff hotel has all the modern facility. Restaurants are awesome, hotel bar has happy hours from 11am till 8pm. Good value and cannot fault the hotel. Delhi is Delhi with possibly the worst traffic congestion in the world. Therefore to avoid spending hours on the road everyday and only criteria for me is to stay in a hotel that is close to where you will be working for the day. 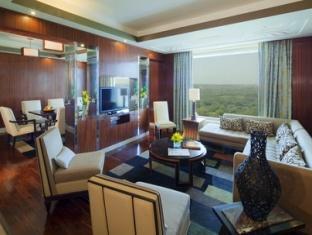 As some of my work is in the Okhla, the Crown Plaza works perfectly for me. We spend 6 nights at the hotel. Breakfast and dinner buffet is fine, not classy but o.k., the Chinese/Italian restaurant at the first floor is a nice alternative. Living in China for 20 years I say the Chinese food was authentic and not "westernized". The service overall was very attentive. 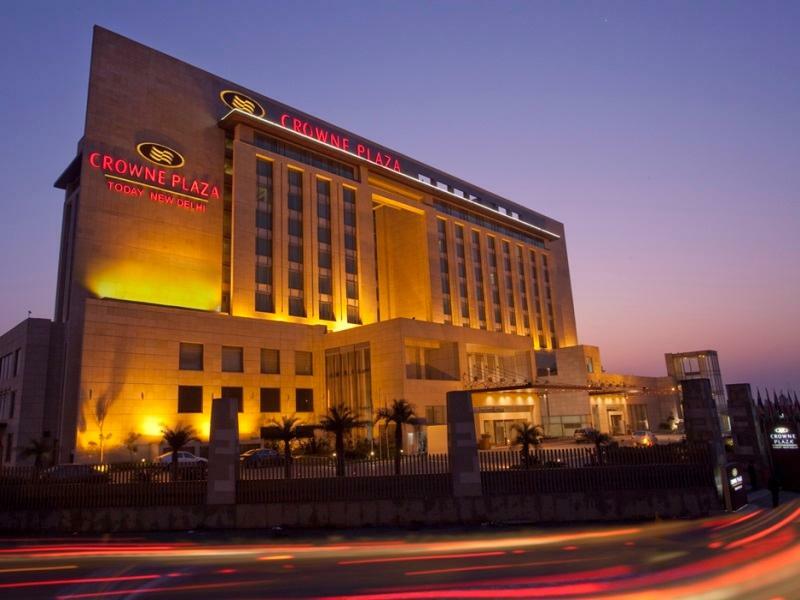 If there would be a 'minus' for a business hotel around Delhi it's only that there are no shops and restaurants in walking distance around the hotel. But no problem, hotel offers everything a business traveler might need. Distance from airport "only" 45 minutes, which is fine for Delhi traffics. Price levels are high compared with Asian countries, but there's no better choice in the area around if one doesn't want to stuck in traffic for hours to get to Okhla areas. We will book it again. สถานีรถไฟใต้ดิน Jasola Apollo - ระยะ 1.53 กม.